ANSBACH, Germany – Twenty-four cadets and students of the Ansbach Middle High School (AMHS) Junior Reserve Officer Training Corps (JROTC), 9th Battalion, visited northeastern France during Veterans Day weekend to learn about the Meuse-Argonne Offensive, which took place in the Belgian region from Sept. 26 to Nov. 11, 1918. This was the fourth field trip sponsored by the 9th JROTC Battalion of AMHS to commemorate the centennial of World War I (WWI). 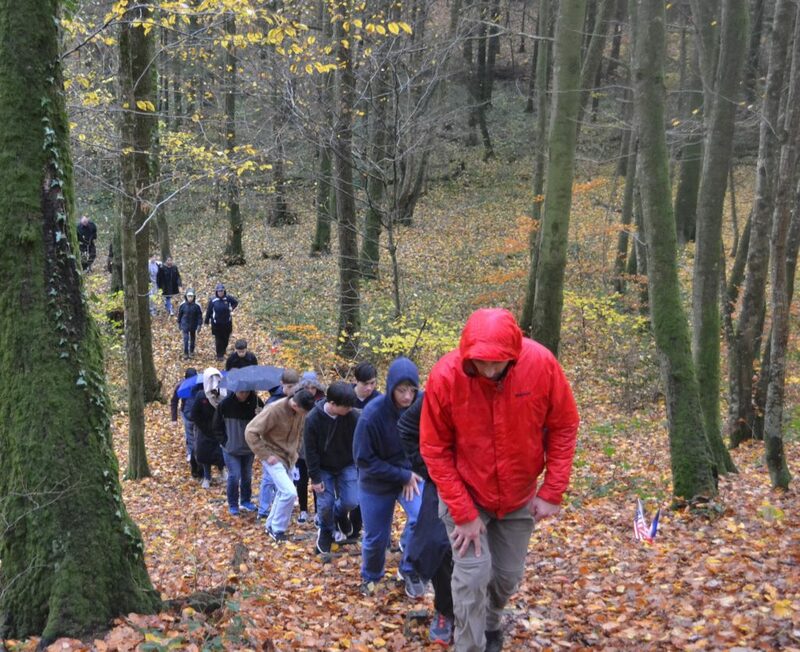 On previous trips, the students explored Flanders Fields, the Somme, Belleau Wood, and the Aisne-Marne battlefields in Belgium. The goal of the trip was twofold: for students to learn more about WWI and the American Expeditionary Forces, and to honor those who served in the Great War. Based on the students’ reflections, the trip was a success. 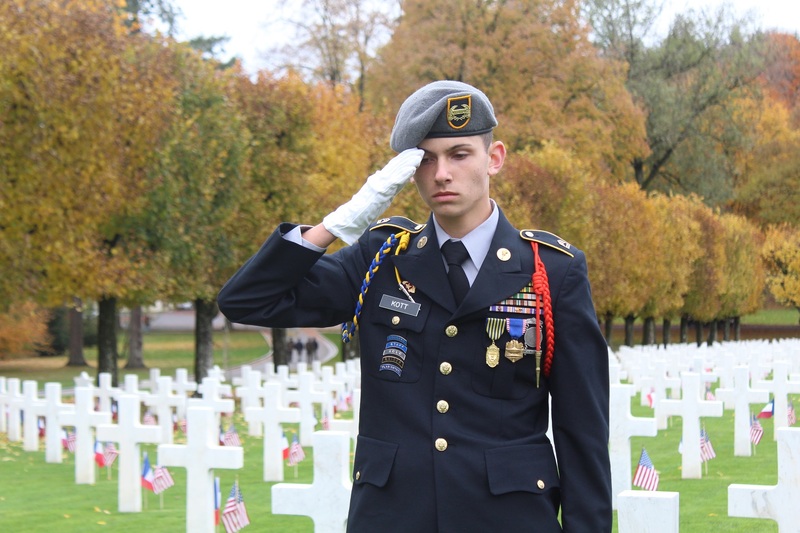 “Learning about millions of Soldiers that sacrificed their lives for a cause they believed in, made me respect them more and motivated me to protect our country,” said Cadet/2nd Lt. Rona Denuna. “I learned so much more about World War I and World War II. It was a very helpful and fun experience,” added Cadet/Sgt. 1st Class Angelina Lopez Turrey. In preparation for the trip, students read about the Meus- Argonne Offensive and were assigned individuals and topics to research to further their understanding of WWI. Throughout the trip, students shared the stories of individuals and animals who played a role in the offensive. They learned about the roles played by ordinary service members as well as those of future president Harry S. Truman and future Generals Marshall, Douglas MacArthur, and George S. Patton, as well as Cher Ami, a brave carrier pigeon. 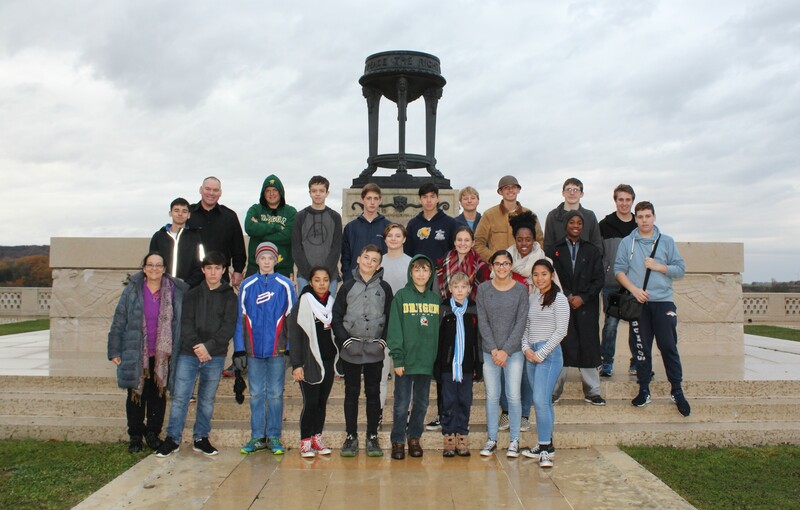 On Nov. 10, cadets toured several sites with tour guide and founder of the Romagne ‘14 – ‘18 museum, Jean Paul De Vries. The first stop was the Romagne-sous-Montfaucon German War Cemetery. In the museum, students were encouraged to handle artifacts found by Mr. DeVries in the Argonne forest and surrounding areas. He emphasized that each item was connected to a soldier with fears, feelings, and an individual story. The next stop was the Montfaucon American Monument. Dedicated in 1937, this monument commemorates the American victory during the Meuse-Argonne Offensive, when the American First Army forced the enemy to retreat on the Western Front. Students climbed 234 steps to reach the observation platform on top of the memorial with its impressive views of the battlefield. One could look down upon the destroyed church of Montfaucon, one of the “lost towns” of France obliterated during WWI, a stark reminder of the civilian cost of war. Cadet/1st Sgt. Eliana Vales shared her thoughts: “Something that I think left a big impact on me from the France trip was the darker side of the Great War. Stuff that is neglected to be recognized and should be taught.” The cadets were excited to meet and take a battalion photo with General Mark A. Milley, Chief of Staff of the Army who was visiting the memorial with a contingent of U.S. congressmen and women. That afternoon, Mr. Bruce Malone, Superintendent of the Meuse-Argonne American Cemetery, presented an overview of the Meuse-Argonne Offensive to the group. The cadets next visited Butte de Vauquois or Vauquois Hill, where for nearly four years German and French soldiers unsuccessfully used mine warfare to take control of the hill. On Armistice Day, commemorated in the United States as Veterans Day, the battalion participated in a wreath laying ceremony at the Meuse Argonne American Cemetery chapel. After the ceremony, each cadet laid a red carnation and rendered a salute at an individual grave site to honor the sacrifice of that American who gave his life for the cause of liberty. Contemplating on the visit, several cadets shared their thoughts. 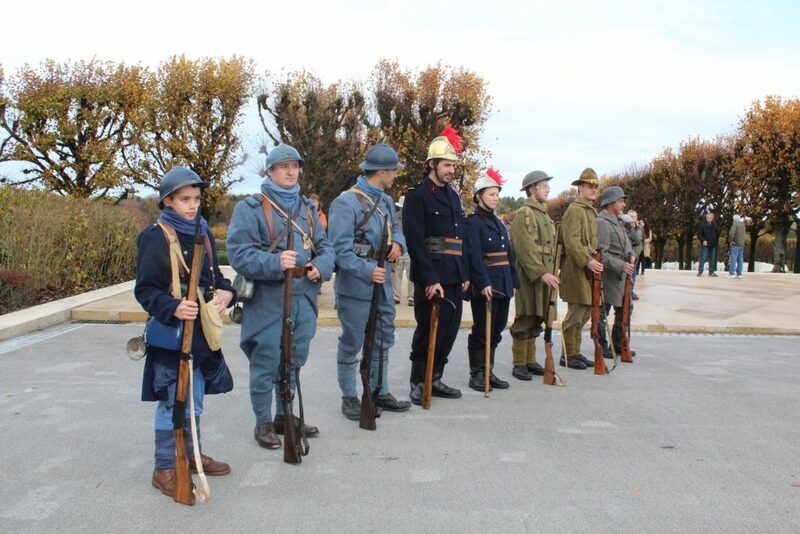 “It was great going to the Meuse-Argonne Cemetery honoring all those soldiers who fought and sacrificed for all of us to live in peace and happiness. I only wished I could have thanked them in person,” said Cadet/Cpl. Joseph Bailey. “Honoring the soldiers gave me a deep respect for what they had gone through. It also helped me see how good my life is because they fought,” added Cadet Alina D. Morecraft. That afternoon, the students walked in the footsteps of the legendary WWI soldier and Medal of Honor recipient, Alvin C. York. The cadets made one final stop in the charming village of Varennes-en-Argonne visiting the magnificent Pennsylvania Memorial. This memorial was erected in 1927 and paid for by the citizens of the state to honor the Pennsylvania men who served in the Great War.